Today is the Feast Day of St. Francis on the liturgical calendar of the Catholic Church. 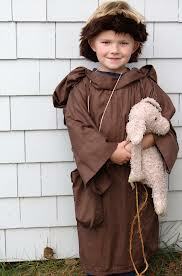 St. Francis has been in the news a lot recently, although he’s been dead for 787 years. Of course there’s the new Pope and his brilliant and inspired choice of name as he attempts to clean up the mess at the Vatican and restore the confidence of the world’s Catholics in their church. Regardless of that, however, today nearly everyone “loves” St. Francis, his very name today suggests simple goodness, mercy, forgiveness and he has become the patron saint of animals and the environment, burning issues for us today. But in all this worthy recognition and discussion, I feel something very important has been forgotten about the true significance of this holy man St. Francis. Statues of St, Francis feeding and talking to the birds are in gardens all over the world and his very name makes a certain sort of tender-hearted people smile and breathe prayers of thanksgiving. But St. Francis is much more than his marvelous prayers that people of all denominations recite today, more than his glorious inspiring poems “Canticle of the Sun” and “Brother Wolf” and “Sister Moon,” as moving and beautiful as they are. St. Francis had a hard life following his decision to abandon his conventionally comfortable situation and to embrace fully a life completely without any reservation dedicated to proclaiming the Good News and establishing an organization that would survive him to carry on his work. His frequent contact through prayer gave him visions and ecstasies, the raptures of mystical saints such as St. John of the Cross and St. Therese of Liseaux and others. When St. Francis finally was released from his trials in this life, he bore on his physical body the stigmata, his hands and feet and side bleeding, of the signs of the cross, and this according to many witnesses, some believers and some not. “St. Francis of Assisi (Italian: San Francesco d’Assisi, born Giovanni di Pietro di Bernardone, but nicknamed Francesco (“the Frenchman”) by his father, 1181/1182 – October 3, 1226) was an Italian Catholic friar and preacher. He founded the men’s Order of Friars Minor, the women’s Order of St. Clare, and the Third Order of Saint Francis for men and women not able to live the lives of itinerant preachers followed by the early members of the Order of Friars Minor or the monastic lives of the Poor Clares. Though he was never ordained to the Catholic priesthood, Francis is one of the most venerated religious figures in history. In 1219, he went to Egypt in an attempt to convert the Sultan to put an end to the conflict of the Crusades. By this point, the Franciscan Order had grown to such an extent that its primitive organizational structure was no longer sufficient. He returned to Italy to organize the Order. Once his community was authorized by the Pope, he withdrew increasingly from external affairs. 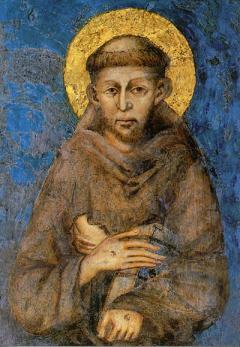 Several good “objective” biographies of Francis of Assisi are available, some of them recent. An inspired moving biography by C.K Chesterton was published early in the twentieth century. Voce mea ad Dominum clamavi! with my voice I made supplication to the Lord. When my spirit failed me, then thou knewest my paths. and there was no one that would know me. and there is no one that hath regard to my soul. Thou art my hope, my portion in the land of the living. Attend to my supplication: for I am brought very low. the just wait for me, until thou reward me. This entry was posted in Literature and tagged Assisi, Catholic, Catholic Church, Francis, Francis of Assisi, hope, Poor Clares, Pope, Prayer, Redemption, Salvation, stigmata of Christ. Bookmark the permalink.